Listen to an interview with the director of the MSPD here. Michael Barrett is the director of the Missouri State Public Defender system. The class action lawsuit filed by the ACLU and others against the state of Missouri over its public defender system has been moved from state to federal court, according to Missouri’s public court records database. Jacquie Shipma, General Counsel for the Missouri State Public Defender, told KSMU that either court would have been appropriate, since the lawsuit alleges violations of both state and federal law. But all of the defendants have agreed to have the case moved to federal court, which is a requirement for the change. She said the Missouri State Public Defender system felt the federal court system would be better for this type of case, but declined to elaborate on why. This lawsuit is centered on the US Constitutional right to counsel, as provided by the 6th Amendment. The motto of the state of Missouri, "Salus Populi Suprema Lex Esto," or "Let the welfare of the people be the supreme law," as seen engraved on the Missouri Capitol Building. In the original petition, the American Civil Liberties Union and other parties allege that Missouri’s public defenders are not adequately representing their clients because of an ongoing lack of funding for the state program. You can view the legal document, originally filed in Cole County, by clicking here. The director of the Missouri Public Defender System, Michael Barrett, told KSMU recently he was not surprised by the lawsuit, which was originally filed in March. “We knew that, when a public defender has 200 cases, 180 cases, that that’s a constructive denial of an individual’s right to counsel,” Barrett said. 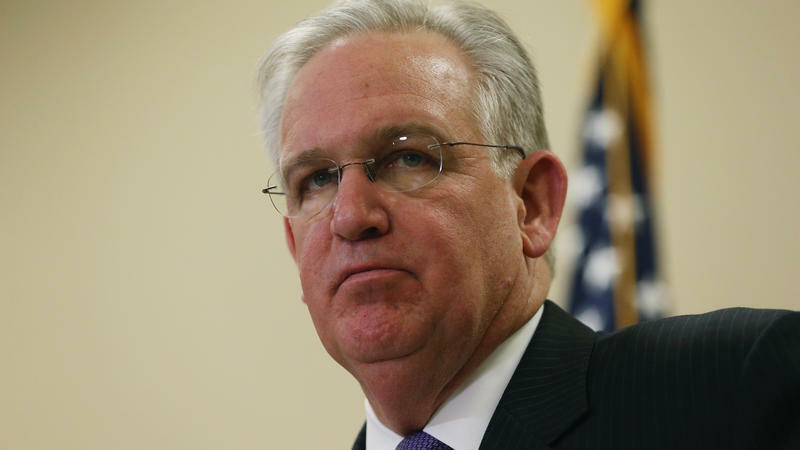 Barrett drew national attention to Missouri’s public defender system when he highlighted the lack of funding by attempting to appoint former Governor Jay Nixon as a public defender in a Cole County case. The New York Times Editorial Board caught wind of that and wrote a scathing editorial about Missouri’s lack of funding for indigent criminal defense. Barrett says he feels he has done everything he can to streamline the MSPD system. “We have 350 lawyers for 82,000 cases. We resolve trial cases—everything from misdemeanors to murder—for an on average cost of 355 dollars per case. And that’s including overhead. Now, anyone who’s ever hired an attorney knows that 350 dollars is used up in the first hour of their work,” Barrett said. And when someone’s liberty is on the line, an attorney simply needs to spend more time than that on a case, he said. “The underfunding of indigent defense is a national epidemic. We’re never going to be at the front line of receiving resources,” Barrett said. But even within that national epidemic of underfunding, he said, Missouri trails at the end. Some states have developed models of partnerships involving private attorneys doing pro-bono work for indigent defendants. Several years ago, KSMU investigated other public defender systems and reported on their methods here. Barrett would not say whether he has looked to other states as examples on successful methods of providing adequate indigent defense. He said the solution does not need to be complicated. “The model is quite simple. You get in a room and you decide what are the maximum caseloads an individual lawyer can handle,” Barrett said. Governor Eric Greitens has recommended in next year’s budget about 25 million dollars less than what the Missouri State Public Defender says it needs to address the funding issue. Shipma said the next step in the federal court case will be for the defendants to file a response of pleading, often referred to as an “answer.” Missouri's Attorney General, John Hawley, will file that on behalf of Governor Eric Greitens and the state of Missouri, both named as defendants. Shipma will file a response on behalf of the parties she is representing, which include Barrett and members of the Missouri State Public Defender Commission. The public defenders office in Missouri says it's been overloaded for years: too many cases, too few attorneys, too little funding. Many people can relate to feeling like there aren’t enough hours in the day. But public defenders here in Missouri say try combining that with low pay, little gratitude, not enough resources, and conditions where someone’s constitutional rights are on the line, and you would get a glimpse of what they see day in and day out. As part of our series, “Justice for All: The Missouri Public Defender System in Crisis,” KSMU’s Jennifer Moore reports. In this segment of our series “Justice for All: The Missouri Public Defender System in Crisis,” we’re taking a tour of the United States to see how other places are running their public defender systems—and what Missouri might learn from them. KSMU’s Jennifer Moore reports. Since the summer, many public defender offices have been temporarily shutting their doors to new clients, saying they’ve got too many cases to handle. In this segment of our series “Justice for All: The Missouri Public Defender in Crisis,” KSMU’s Jennifer Moore looks at the “caseload math” that went into determining when an office can shut its doors. In our final segment of our five-part series “Justice for All: Missouri’s Public Defender System in Crisis,” KSMU’s Jennifer Moore looks at the options for the system’s future. Early next year, the Supreme Court of Missouri is expected to rule on whether public defenders can continue closing their doors to new clients when their caseloads get too high. But even if the Court says they can, the question of how to provide criminal defense attorneys to Missouri’s poor will remain unanswered.